UNHCR’s new global strategy: Refugee Livelihoods and Economic Inclusion. 2019-2023 Global Strategy Concept Note. 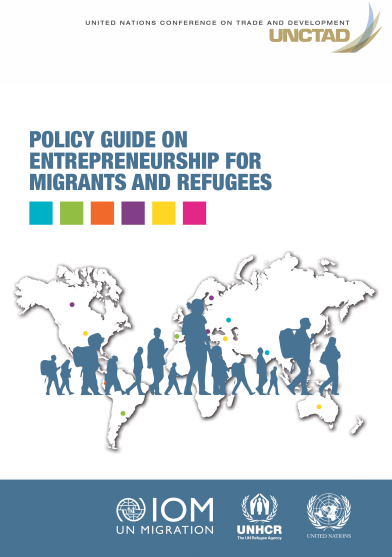 In 2018, UNHCR, IOM, and UNCTAD released this Policy Guide on Entrepreneurship for Migrants and Refugees. In November 2018, IRC released this report from Kenya, Dreams Deterred: Opportunities to Promote Self-Reliance for Somali Refugee Youth in Kenya. Uganda's Self-Reliance Strategy: What difference does it make? In January 2019, The Refugee Studies Center released a report on Self-Reliance in Uganda, Uganda's Self-Reliance Strategy: What difference does it make? In December 2018, Social Sciences released this report, Refuge in the City. 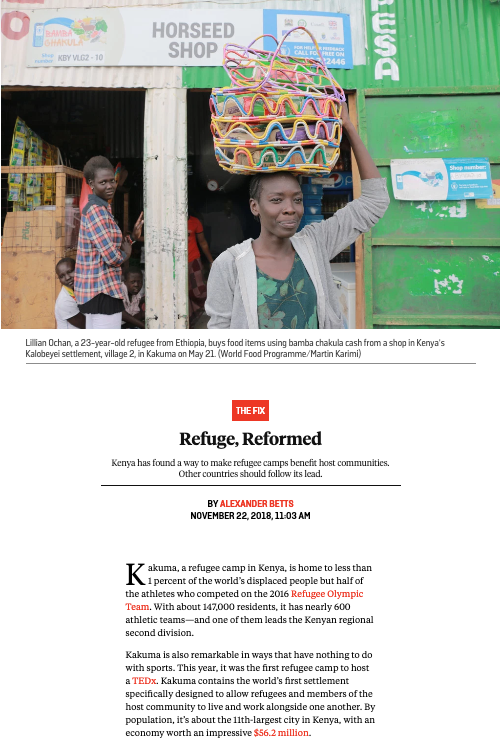 In November 2018, Foreign Policy published this piece, “Refuge, Reformed,” which highlights a model and approach in Kenya to support both refugees and host communities in Kakuma. In November 2018, Gideon Maltz (Tent Foundation) and Cindy Huang (CGD) wrote this opinion piece, Granting refugees the right to work can help revitalize economies, for DevEx. 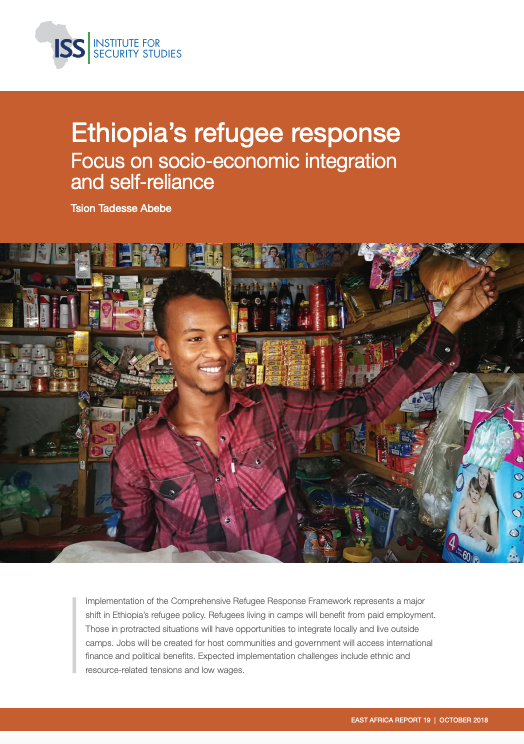 In October 2018, The Institute for Security Studies published, “Ethiopia’s refugee response: Focus on socio-economic integration and self-reliance,” by Tsion Tadesse Abebe. This report reviews the shifting refugee policy in Ethiopia and how the Comprehensive Refugee Response Framework is being implemented. In June 2018, The Overseas Development Institute published a series looking at Dignity in Displacement, starting with a review of the literature (here) and specific reviews of dignity in different refugee settings such as Lebanon and Bangladesh. This June 2018 issue of Forced Migration Review provides a rich and nuanced look at policy and market dynamics in refugee hosting contexts around the world. Pieces vary from the macro – looking at the regional economic impact of the Syrian crisis to the micro – a review of the role rural grocery stores can play in integration in Denmark. Please note the two pieces written by COP members, Nao Omata (Refugees’ engagement with host economies in Uganda) and Ziad Ayoubi with Regina Saaverda (Refugee livelihoods: new actors, new models). In October 2018, The Center for Global Development released this report, The Economic and Fiscal Effects of Granting Refugees Formal Labor Market Access. The report, written by community members Cindy Huang, Jimmy Graham along with Michael Clemens can be found here, along with a report briefing and a handy fact sheet. If you have a chance, check out the webcast discussion here. The panel features Michael Clemens (CGD), Gideon Maltz (Tent Foundation), Radha Rajkotia (IRC), Paolo Verme (World Bank) and is moderated by Cindy Huang of CGD. This October 2017 Brief from the Refugee Studies Center, Refugee Self-Reliance: Moving Beyond the Marketplace, features an article (page 5) written by RSRI leaders Amy Slaughter and Kellie Leeson, entitled: How do we measure refugee self-reliance? This report summarizes the March 2017 Nairobi Self-Reliance Workshop. In October 2017, RSRI leader Amy Slaughter, published this article (page 6), The Case for Measuring Refugee Self-Reliance, in Evaluation Connections from the European Evaluation Society.